In 2015 we were honoured to welcome Trudie Ballantyne, Course Leader, BA (Hons) Editorial & Advertising Photography at The University of Gloucestershire to our blog following the success of a number of University of Gloucestershire students and alumni at our awards. The success continued in 2017 when Emma Boyns won the BBC Good Food Fresh Talent Award, an exciting one off opportunity for a young aspiring food photographer to win a 6 month paid placement at BBC Good Food HQ. For 2018 we have introduced a Student Food Photographer of the Year category to recognise the talented photographers emerging in the food photography field. With this in mind, we have invited Trudie back to the blog to talk about the photography curriculum and our Student Food Photographer of the Year category. Welcome back Trudie, thank you for joining us. You must be so proud of Emma Boyns and her achievements in the 2017 competition, what’s it like to see one of your students excelling like this? It's really great to see Alumni of our course continue to succeed in their professional careers. Emma winning the Fresh Talent Award has been a terrific opportunity for her and so inspiring for current students; she recently came in to the University to share her experiences with current 2nd and 3rd year students. She really emphasised the importance of entering competitions such as the Pink Lady® Food Photographer of the Year, not only is it thrilling to be part of the exhibition, but the opportunities and contacts that arise from having your work featured is just so valuable. She has absolutely loved working with the team at BBC Good Food magazine, a fantastic opportunity creating stills and moving image pieces for the magazine and website and has fitted in so well they have extended her internship for another six months. It has now become a tradition for both current students and graduates such as Emma to enter the Pink Lady® Food Photographer of the Year. We are extremely pleased and proud when they are short listed to show in the exhibition and often go on to win a category award. Are you seeing an increase in applications for the BA Editorial & Advertising Photography Course with the rise in food photography on social media? It's interesting you ask this - the answer is yes and more applicants are demonstrating a passion for food photography. I think it's due to not only the popular use of social media platforms like Instagram but also the popularity of T.V. programmes such as Bake Off and the proliferation of food bloggers. People who love photography and food can now see the two can work together and grow into a successful professional career. How can students set themselves apart and make a name for themselves in such a competitive field? It's all about communication, not just online but more importantly face to face. The students on our course are taught and put into practice the professional use of social media, not only as a carriage for self-promotion but for creating and becoming part of a community, building professional contacts and using it as a tool to source people and content for their practice. We have numerous visiting speakers, mentors, and a wealth of contacts in the industry and we expect our students to always ask questions - being interested and interesting is what will really make you stand out. Of course their imagery needs to be creative, technically competent and applicable to the context in which it will be used or viewed, therefore gaining an understanding of how the industry works is vital. It's very important you keep shooting personal work, not just what you are required to produce for the course you are studying. For our Student Food Photographer of the Year category entrants should look to be inspired by the themes in any of our categories, whether classical food photography or social documentary. With such a wide brief, open to lots of creative interpretation, how would you recommend students approach their entries? Whether a single image, a series or moving image piece, really think about the narrative, what do you want your audience / judges to feel and how do you want them to react to your images. I always say to my students, you need to excite all the other senses other than sight, the photographer should ask themselves, what does it smell like, what does it feel like, what does it taste like and even what does it sound like? Then really think about how to communicate all those elements through still or moving image. You could be documenting a food story on location or creating a set in the studio, what ever it is you should always consider the light. If using available light - ask yourself - do you need to adjust your colour temperature settings or add a bit of additional light, even by a subtle use of a reflector, don't go over the top, but don't compromise the aesthetic you wish to create by not knowing how to make the best of a situation. Your research and inspiration should be broad and extensive, look at artists, writers, musicians - inspiration shouldn't come just from other photographers. It's about creating your own voice, not regurgitating what has been before. Can you share any news or exciting projects taking place at The University of Gloucestershire? Well in fact yes I can. In response to the changing professional landscape of image creation and the diversity of professional careers our graduates move into we are proposing a change of course title. 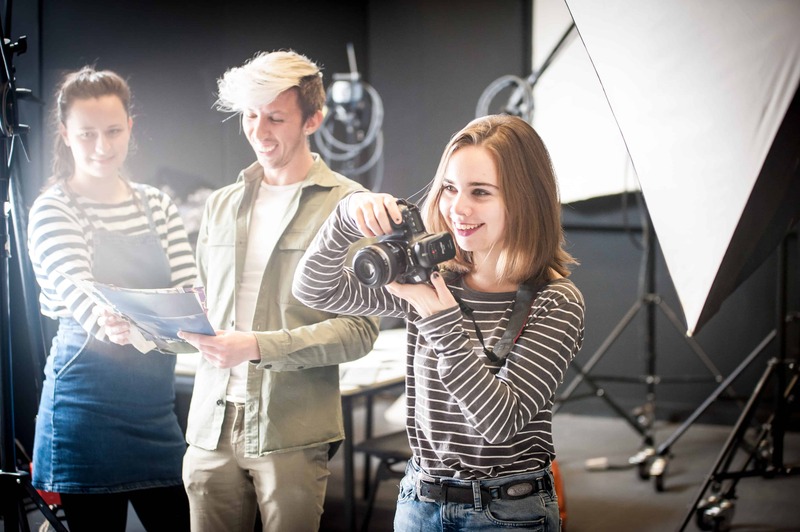 We are planning that from Sept 2018 BA(Hons) Editorial & Advertising Photography will become BA(Hons) Professional Photography for the Creative Industries. We have a saying 'what better way to live your professional life than by documenting your passions'. If you research, understand and love the subject, you will be able to build of body of work people will be interested in seeing. Our students create stills and moving image of everything from food to fashion, interiors to music, people to cars and go on to very successful careers after graduating - Jonathan Gregson, being another of our Alumni, a regular winner in various categories of Pink Lady® Food Photographer of the Year.